If you’re into thrilling adventure, high-definition graphics and exhilarating jackpots, look no further than Mr Smith Casino. 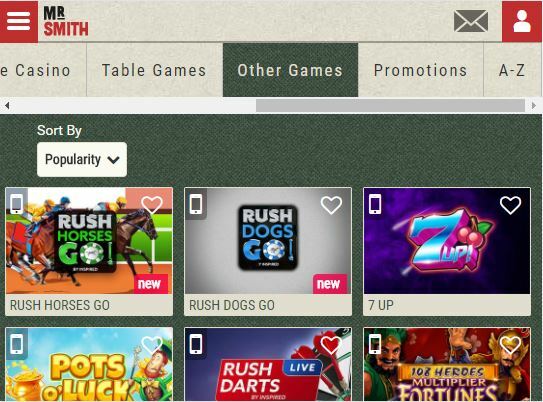 Offering a vast selection of popular online games including over 500 slot machines, live casino featuring classic as well as modern table games and an abundance of free flash online games, Mr Smith is home to huge winnings, high jackpots and a constant stream of new and exclusive amusements, and is accessible on most Android and iOS devices, as well as desktop. Mr Smith is part of BML Group, which operates some of the biggest and most well-regarded names in the industry. Although it styles itself as a British casino, players from around the world can join up and participate. Mr Smith Casino is in possession of all the required licenses, and members can rest assured that their gaming experience is completely safe. The website is operated by BML Group Ltd which holds a Maltese company registration number. The site is regulated by the Malta Gaming Authority, who renewed the license in July 2017. Mr Smith is also licensed and regulated by the British Gambling Commission for residents of Great Britain. Due to government regulations and corporate restrictions, the casino is unable to offer gameplay to anyone residing in the following countries: The United States, France and French Guiana, China and Hong Kong, Italy, Spain, Belgium, Martinique, Réunion and Guadeloupe. Formerly going by the name of Harry’s Casino, this exciting gaming house burst onto the scene in 2014 when it underwent a rigorous re-branding, rendering it one of the most streamlined and user-friendly casinos in modern gaming. Gameplay is available on a great number of platforms including giants such as IGT, Microgaming and NetEnt among others. Some of the top slots on offer are Rainbow Riches, Game of Thrones and Jimi Hendrix, and the slot library contains plenty of progressive jackpot slots, including Mega Moolah. There are bonuses aplenty in any reputable casino and Mr Smith certainly doesn’t stint in this area. Of particular note are the site’s daily jackpots introduced by Red Tiger Gaming. These must fall before midnight every day, guaranteeing a roar-some experience for some lucky Mr Smith gamblers. Red Tiger also offers 3 special, exciting jackpots. The Mega Jackpot follows a classically progressive path, falling at any time and at any value; the Super Jackpot must pay out before it reaches €/£100,000; on the other hand, the fast-paced Quick-Hit falls periodically before it hits €/£500, adding to the existing bonuses. Upon registering, new members are entitled to a 100% deposit bonus up to €/£200, meaning that new players potentially have €/£400 to play with. Players should be aware that any winnings from the bonus should be played through 35x within 14 days in order to get the chance to cash out any remaining profit. Not all players are eligible for the bonus, and if you deposit via Skrill or Neteller you also won’t be able to claim it. Existing members should keep their eyes out for promotions and bonus incentives for loyal customers. 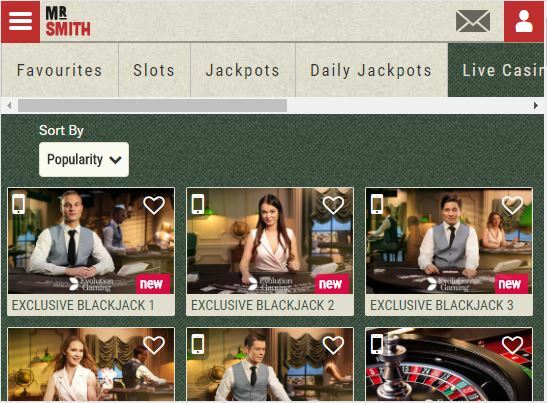 Mr Smith prides itself on employing an extremely user-friendly interface and potential gamblers with the site will be pleased to find that registering an account is quick and easy. New gamers will be asked for a quick deposit upon registering (minimum €/£15), claim the deposit bonus and, upon proving their identity and age (18+) start playing immediately. If you’re eager to start, you’ll find that the website employs instant gameplay with no downloading of unnecessary software, so traditional casino games, table games and flash online games are just a click away. The authenticity of the gaming experience is further enhanced with top of the range HD cameras and the possibility of live chats with some of Mr Smith’s most charismatic dealers. Pick a theme, any theme. Whatever your taste, budget or skill level, at Mr Smith you will find not one, but several games to pique your interest. It really isn’t an exaggeration to say that Mr Smith has one of the largest selections of casino games gathered in one place in the whole market. Mr Smith is a veritable treasure trove for gamblers, from traditional live casino favourites such as blackjack and baccarat, available in three exciting versions (Pro, Live and VIP), through more modern card games including Red Dog and Craps, to a multitude of online slot machines – over 500 at last count. The slots feature a vast selection of themes including TV series like Family Guy, film-themed slots such as the Wizard of Oz and Transformers, and music, for instance, Guns ’n’ Roses and Michael Jackson. High rollers will find that winnings are large and the jackpots frequent, while Mr Smith’s highly acclaimed Video Poker, which requires a certain skill level, is home to several gems such as Deuces Wild Double Up and Jacks or Better. Amateurs are very adequately catered for as well. Live roulette requires no deposit, attracting more cautious gamers who are allowed to get the feel of the game before attempting to place higher bets, while the website’s popular Scratch Cards (Irish Eyes and Foxin’ Wins Scratch) allows for less regular, but nevertheless equally rewarding play. Mr Smith’s Red Tiger Gaming selection has also proven to be a roaring success, incorporating a satisfying array of multi-skill games based on the “science of fun” and featuring several stimulating themes like the Far East, Ancient Egypt and under the sea. 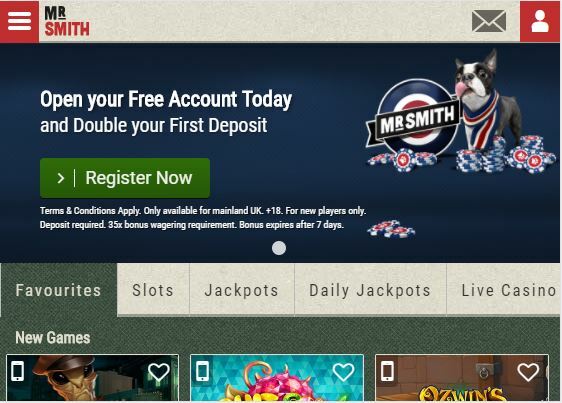 Few websites can match the revamped interface of Mr Smith Casino. Replete with bold reds, whites and blues, Mr Smith is stunningly planned, employing sharply-defined graphics and eye-catching designs. 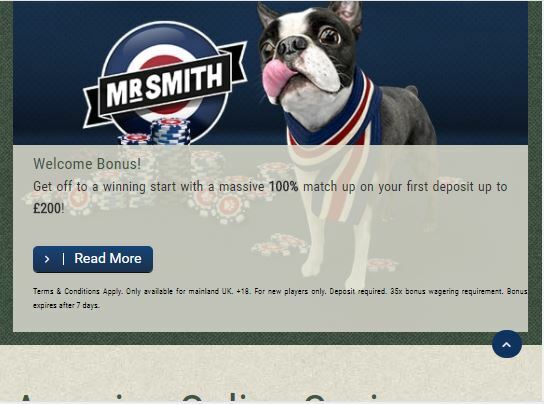 The website wholeheartedly embraces a thoroughly British theme, and this is particularly evident in the Mr Smith mascot: a cute bulldog puppy, clad in the colours of the Union Flag, standing proudly among several piles of colour-matched casino chips, all embossed with the site logo – a deep red paw print that recurs regularly throughout the whole site, merging seamlessly with the overall theme. The casino has come far from its Harry’s Casino days and now boasts an extremely user-friendly interface. Games are sorted into categories, making the site extremely easy to navigate. Seasoned gamblers will appreciate the accessible way the categories are planned – each game is sorted in several ways, including by popularity, by jackpot amount and by freshness. Particularly handy is a list of all the games available on the website, citing each item in alphabetical order, so users can very quickly find their preferred games. General site information, including payment and security info, are also readily accessible. Mr Smith is all about security and transparency. The T&Cs clearly lay out the site’s policy on how it collects and uses player information, and the site employs SSL encryption. It also partners only with reputable game developers, so players can be certain that all games are fair and entirely random. Variety is the name of the game at Mr Smith Casino and the website carries this through to a wide range of payment options. Gamers can rest assured that both their deposits and their winnings are kept safe and secure, regardless of the amount. Transactions big and small can be made using most widely-accepted credit and debit cards, including Visa and Mastercard. Deposits made by credit card will be transferred to your betting account immediately. Please allow 3 to 5 working days for regular bank transfers. The site accepts two currencies – Euros (€) and Pounds Sterling (£) – so payment can be made in either currency, facilitating flexibility for both British and EU residents. E-wallet services such as Moneybookers and Entropay are also available. Please note that, while payments made through Neteller or Skrill are accepted, deposits made with such will be ineligible for welcome bonus offers. You’re likely to become a regular visitor if Mr Smith Casino gets your tail wagging. The website values its members and offers several customer support services. Apart from frequent warnings against gambling addictions featuring regularly throughout the site (the casino works closely with the Global Gambling Guidance Group making gambling support just a click away), Mr Smith is always ready to listen to its loyal customers whatever their lament. Live chat is available 24/7 with the predominant language being English, although other languages are sometimes available. If, for some reason, you are unable to make use of the live chat, the website boasts an admirable FAQ inventory where every possible question has been thought of. Failing this, players can send an email to support@mrsmithcasino.co.uk and expect a response within the hour. Alternatively, they can choose to speak to one of their customer service representatives by calling +44 808 238 0075, with a minimal response time of 0 to two minutes. The casino employs seasoned promotions to enjoy, with updated information on current and upcoming promotions being uploaded regularly. Clients qualifying for VIP programs are also entitled to special support services.